In January of 1989, I was living the uniquely exciting life of a young, single, stand-up comedian. From my home base of San Francisco, I would venture to cities all over the country as a headlining entertainer. Fun stuff indeed! I was making way better than average money, and I had absolutely no tedious obligations or responsibilities to drag me down other than getting myself to the club on time—which, on occasion, was way more of a challenge than it should have been. I was living the life! Then, on January 10th 1989, at Cobb’s Comedy Club in San Francisco, I had the distinct honor of performing on the same bill as two comedy legends: Bobcat Goldthwait (Police Academy and other films) and the one and only Mr. Robin Williams. Yes, THAT Robin Williams. You know, the one who was a comedy genius. That one. It was a magical night that would change my life forever as I rocked the house, my career took off, and I became rich beyond measure. Well…it was a magical night, but it contained more personal magic than career magic. Although, and make no mistake about it, I was the king of comedy that night…at least until those other two guys took the stage. In the audience that night was Laurine, a smart, funny, engaging, and stunningly beautiful woman who just eight months later would become my wife. Of course, the fact that she married me does put the “smart” designation slightly at risk. I sat down and she immediately challenged me and my life choices. Just five minutes into our first conversation, she asked, “Are you happy?” Can you imagine that? Ha! I thought to myself, “Hello? Did you not just see me on stage with Robin Williams? Uh…I think I’m pretty happy!” But, her statement, which she delivered as if she had been spying on me for the past five years, stunned me. How could she know? And what really terrified me was that she somehow had confirmed the same realization that I had considered and shoved out of my consciousness so many times before: what if I attain my show biz dreams and they don’t actually make me happy? What if there’s something more? What if I end up like so many other rich and famous people who are always in the news for having miserable lives? I had known this woman sitting across the table from me for about 10 minutes and she was scaring me to death. But, I also couldn’t take my eyes off her, and I couldn’t stop listening to her. Soon after we married, we were expecting a bundle of joy, which officially made me the most excited guy in the world. I was working gigs AND starting a family. I was proving, I thought, that you CAN have your cake and eat it too. That baby boy, my son, Anthony Michael Guido, was born and lived to the ripe old age of sixteen hours. His lungs hadn’t developed properly, and he just couldn’t breathe on his own. Laurine and I were with him for every second of his short time here, holding him, caressing him, and whispering our love to him until he left us and returned to his home in Heaven. It was then that I fully understood that our bodies really are composed mostly of water and that at times like this, when our hearts are broken and our grief is actually physically tangible, a lot of that water can seep out through our eyes and run down our cheeks and even onto our clothes. I still think about him often, and he motivates me to be a better man so someday, maybe, I can get to where he is. So, when Laurine became pregnant again, I was actually terrified because of what I had learned from my first painful pregnancy experience. But on Oct. 13, 1991, Maria was born healthy and strong, and all my fears and reservations went right out the window as soon as I saw her and held her. She was beautiful, she was wonderful, she was perfect, and I immediately fell in love with her. As I would hold her in my arms and rock her to sleep as we listened to Andrea Bocelli together, I would look at her beautiful face and be overcome with how much I loved her. She totally had me. Once again, not so fast. Right around her second birthday, Maria went through a series of ear infections and was prescribed the usual antibiotics. During this time, her pediatrician also thought to give her three immunizations during one visit: DTP, Polio, and MMR. We started to see changes in her almost immediately. Seemingly overnight, she started squealing and screeching instead of talking. She stopped making eye contact with us and acted like she couldn’t hear us. She would sit and stare at absolutely nothing without making a sound for very long periods. At other times, she danced on her toes and flapped her hands for seemingly no reason. She stopped eating. She stopped sleeping. She stopped being “my” Maria. I was losing her, and the loss was crushing me. To say that I felt like the rug had been pulled out from under me, or that I had been punched in the stomach, would have been a gross understatement. I was devastated. I didn’t know what to do. I didn’t know what to think. All I knew was that my beautiful, sweet, adorable, bright, happy, and loving little girl, who I had given my heart and soul to, was being changed each day right before my eyes into someone that I didn’t know anymore and who seemingly didn’t know me. I just wanted her to go back to the way she was. I wanted her to talk again…to say things…things like “Daddy” and “I love you.” I wanted to be able to hold her. I wanted to play with her. I wanted to read her stories. I wanted to understand her. I wanted her to be “my” Maria again. She was right! I had to stop focusing on how all of this affected me and instead, focus completely on Maria and what I could to help her and keep her safe. I mean, I loved her so much. Did I love her any less now? Of course not. Then what was keeping me from being completely happy with her? Why couldn’t I be more like my wife: positive and proactive…or even functional? What was required was a completely different perspective, and I had to look at Maria in a completely different way. I had to “man up” and put my love into action. 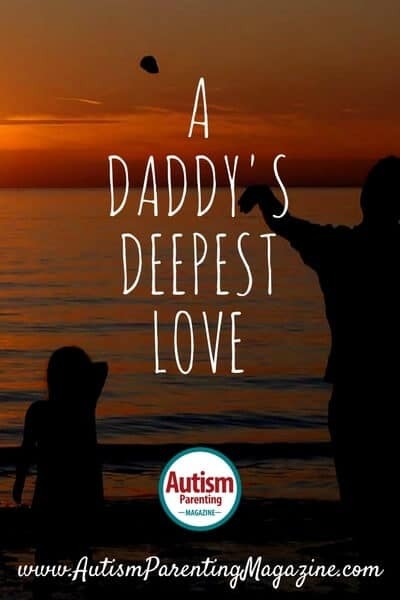 Over time I started to see her and her autism as a fantastic opportunity to experience an entirely different and very powerful kind of love as I gladly served my daughter, which made me love her even more. As a comedian, the reward was always laughter from an audience. That was the validation. But with Maria, the reward was much less direct, but oh so powerful. It was merely knowing that I was helping her. So, as time went on, Maria, through her innocence, her vulnerability, and her pure, pure sweetness, got me to the point where I not only loved her and accepted her autism, but I am now so incredibly grateful for it all. I am just grateful to have her in my life exactly as she is, and I wouldn’t change a thing. She continues to make me a better person every single day. So, can I be considered to be a “real” man in today’s world? I don’t know and, quite frankly, I don’t really care. But this much I do know: that because of Maria, I’m a much happier one. A dedicated husband and father, Mike put his comedy career on hold for a number of years as he and his wife, Laurine, raised their family with special attention and focus on their daughter, Maria, who has severe or low functioning autism. The Guido’s founded and managed the M.A.R.I.A. Foundation, a non-profit organization that supports children with autism and their families. Mike Guido is an extremely talented and successful comedian who has made eight national TV appearances, including SHOWTIME, MTV, VH1, and A&E. He also has a comedy CD, “Who Needs Sanity? !,” which can be heard regularly on Sirius XM Satellite Radio. A very well established and respected performer, Mike has shared the stage with some of today’s biggest stars, including Jay Leno, Robin Williams, Ellen Degeneres, and Dana Carvey. He has a featured role in the film “The 95ers” as well as television commercials for Universal Studios and Cannon Cameras. The San Francisco Chronicle said this, “Mike Guido, a poised comic who seemed utterly at home on stage and commanded the audience’s attention without seeming to try, was priceless and well worth seeing.” A dedicated husband and father, Mike put his comedy career on hold for a number of years as he and his wife, Laurine, raised their family with special attention and focus on their daughter, Maria, who has severe or low functioning autism. The Guido’s founded and managed the M.A.R.I.A. Foundation, a non-profit organization that supports children with autism and their families.